As a libertarian, I sometimes make the moral argument for small government. If it’s wrong to steal other people’s income or property, then shouldn’t it also be wrong to use the coercive power of government to take their income or property? Defenders of the welfare state respond by saying it’s “the will of the people,” but the libertarian counter-response is to point out that 51 percent of the people shouldn’t be allowed to pillage 49 percent of the people. But since I realize that some people aren’t persuaded by philosophical arguments, much of my work focuses on the practical or utilitarian case for small government. That’s why I repeatedly show how market-oriented jurisdictions out-perform statist nations. I’ve even challenged my left-wing friends to come up with a single example of a successful big-government economy. Needless to say, the only response is the sound of chirping crickets. Now let’s add one more piece of evidence to our arsenal. I’ve already shared lots of data and information when making the case that Obama’s big-government policies have not worked, but, in the spirit of Mae West, there’s no such thing as too much proof that statism doesn’t work. Especially when the evidence comes from the Obama Administration! Here are two damning charts from a just-released Census Bureau report on income and poverty in the United States. The first chart shows that median household income, adjusted for inflation, is nearly $1300 lower today than it was when Obama took office. That’s a horrible outcome, particularly since the recession ended back in the summer of 2009. By the way, I agree with critics who say that the household income data is a less-than-ideal measure of prosperity. That being said, it’s still a benchmark that allows us to see how well the economy does in some periods compared to others. And if you look at the above chart, you clearly can see that households obviously did comparatively well during the market-oriented Reagan and Clinton eras. Now let’s look at some data that should be very compelling for leftists who claim to be especially concerned about the less fortunate. Here are the latest Census Bureau numbers on the number of people living in poverty as well as the overall poverty rate. As you can see, there’s been no progress during the Obama years, even if you absolve him of any blame for the deteriorating numbers caused by the recession. 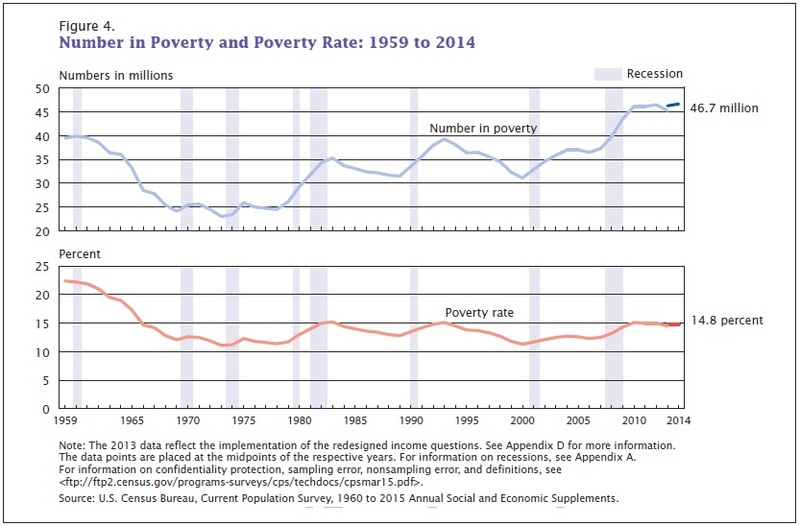 By the way, I can’t resist pointing out that this chart shows how the poverty rate was declining until the so-called War on Poverty started in the mid-1960s. And if you can click here to learn more about how bad government policies have trapped people in poverty. And if you’re interested in several hundred years of data on poverty and government policy, click here. Barack Obama is a despot in some ways. He issues executive orders and nobody has the backbone to tell him he is out of line. Obamanomics are working just as planned. It is a success story! They are turning the US into a turd-world country just as planned.